24 Nov Skiing child! Why it is good to start at the age of 3! Parents often ask us how old should be their children to start learning of skiing. They do not believe when we inform that the best age is 3 years old. Our years of experience show that precisely this period in child’s growth is mostly optimal on account of capability of concentration, cooperation and appropriate physical ability. Activities for three-year-olds have to be, however, suitably prepared so that child will not discourage himself from skiing. The most effective form of activities is connection of learning of skiing with instructor and different kinds of fun and entertainment. It is important to divide time of activities in proportion 60% and 40%, where 60% is time spent on games on snow and 40% is time spent on technical ski training. Why? Child at the age of 3 years old has very limited time of concentration, he is not used to typical training and following the instructions given by new people, just like older children and, above all, he gets bored very fast. 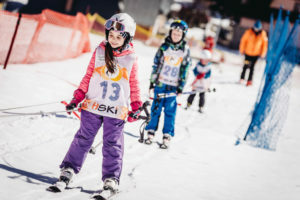 Therefore it is worth to choose training programs of ski schools which offer specially created programs of learning of skiing for three-year-olds. In other case, treating child to individual lessons may successfully discourage him from learning and, at worst, child will reminisce skiing negatively for years. (Polski) HSKI Z PYTANIE NA ŚNIADANIE ZAKLINA ZIMĘ! [VIDEO] Pytanie na Śniadanie: Ski courses for children with HSKI are the greatest winter attraction in Poland!